Part of what makes college football so great is its unique combination of the enduring with the evolving. On one hand, there are standards like traditions, storied rivalries, and beloved venues that each generation shares with its predecessors. On the other hand, there is constant flux; coaches come and go, conferences realign, and every team’s roster looks completely different every 4-5 years. Over the past few years, the Army-Navy game has exemplified this dynamic of things changing, and things staying the same. It is one of college football’s oldest and most steadfast rivalries, but recent years have featured storylines highlighting that season’s changes. Army-Navy has been broadcast nationally for more than 50 years, including the last dozen on CBS, and will continue that way until at least 2018. It has, however, been moved from the first to the second Saturday in December. Change has been a theme on the field as well. The 2007 game brought us Stan Brock’s first year at Army, along with the speculation that it might be Paul Johnson’s last year at Navy. Last season was Ken Niumatalolo’s first as the Mids’ head coach, and he faced off against Army’s new option offense. The 2009 matchup will be the series’ third straight with a new head coach on the sidelines, as Rich Ellerson is wrapping up his first season at the helm of the Army football program. If you say so, Jim. I’m not sure what made it more “advanced” in San Luis Obispo– maybe they wore jet-packs or something– but whatever he saw in those games has yet to materialize on the Hudson. Let’s put Army’s offensive ineptitude in perspective. Ricky Dobbs has 23 rushing touchdowns so far this year. The entire Army offense has 13. Even with a lighter schedule designed to get the team to its first bowl game since 1996, the MOST ADVANCED TRIPLE OPTION is actually generating four fewer yards per game than Stan Brock’s parade of mediocrity did in 2008. The Black Knights average a meager 16.5 points per game. They have reached the 20-point plateau all of 3 times this season, and in one of those games they needed an interception return for a touchdown to get there. Jokes about super-advanced offenses aside, this doesn’t mean that there’s some deficiency in the Army scheme. They just don’t have players to do everything that the offense is capable of. As bad as they were last year, Army still had a workhorse of a fullback in Collin Mooney, who ran for a school-record 1,339 yards. This season, the offense lacks any real big-play threat. Of the six Army players who have at least 19 carries on the season, only one– slotback Patrick Mealy– averages more than 5 yards per carry. Of the seven Navy players with 19+ carries, only two don’t average at least that much. Ellerson’s passing game at Cal Poly centered around wide receiver Ramses Barden, a 6-6 monster who accumulated 4000+ receiving yards and 50 TDs in his collegiate career, and ran a 4.48 40-yard dash at the NFL combine before being drafted by the New York Giants. 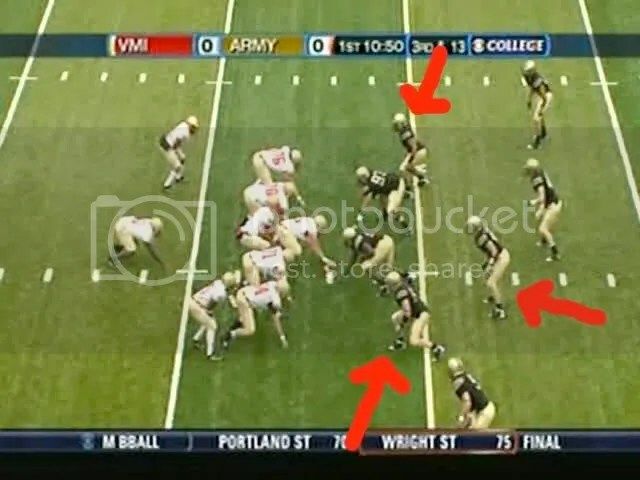 The Army passing game consists of throwing jump balls to a 6-10 converted offensive tackle. Needless to say, the whole package is a work in progress. In some ways, the 2009 edition of the Army offense is the opposite of 2008, with the fullback position being the least productive. That doesn’t mean they don’t run between the tackles, because they do. They just do it by getting the ball to their best runners; Mealy, and plebe QB Trent Steelman. Last year, Navy was able to control the Army offense by dominating the line of scrimmage, and having safety Wyatt Middleton spy on Mooney. A similar approach might work this year, with Middleton focusing on Steelman instead. How the plebe handles his first Army-Navy game will certainly factor greatly into the outcome of the game. Yet even with an offense that struggles mightily, Army is still just one win away from its first bowl game in 13 years. It seems impossible until you remember that Ellerson isn’t really an “option” coach. He is dedicated to bringing in coordinators who can run the spread option, but his reputation was made on the other side of the ball. As a defensive innovator, Ellerson brought to Army the same double eagle flex scheme he used with great success as the defensive coordinator at Hawaii and at Arizona, with the famous “Desert Swarm” defense of the ’90s. Army has adapted well, ranking in the top 20 in total defense, and an eye-opening 5th against the pass. Josh McNary has emerged as a star playing the DE/LB hybrid “quick” position, registering 22.5 tackles for loss this season (2nd nationally), including 12.5 sacks (3rd). The defensive ends aren’t really defensive ends, lined up instead in a 2-point stance in “hybrid” positions. The same is true for the “hybrid” middle linebacker. The line between linebacker and safety is blurred as well. So what do we have? Is it a 2-man front? A 4-man front? 5-man? Who’s going to attack the line of scrimmage? Who’s going to drop back into coverage? These are the questions that Ellerson wants the offense asking itself as he mixes his coverages and presents multiple fronts all in one. That long QB run was almost painfully slow. But notice how long it took the Army defense to chase the quarterback down. They’re well-coached, but they still aren’t fast. And with leading tackler Stephen Anderson out due to injury, they’re going to be even more limited. Expecting the play to be run to the strong side of the field, he lined up his safety there to key on the pitch. In the Navy spread, when the slotback starts in his tail motion, he essentially creates a “strong” side in the direction of the motion. That’s where the safety attacks. Semi-conventional, anyway, with the 5-man front. There’s still some mixing & matching between the LBs and the secondary. Even in this alignment, though, they employed the same tactics. Ali Villanueva: I don’t know what is going to happen. I always try to look at it by focusing on my position. I am not going to look at what the fullback is doing or the offensive line is doing. I don’t know how many catches I am going to have, I might drop all the balls, I might catch them. At the end it has to be a “W’ and that’s all that matters. They can come out and throw anything they want at us and it doesn’t matter, we are going to win the football game. There’s no doubt that Army should feel good about themselves, coming into the game with postseason hopes still alive. But talk is cheap. Here’s to the Mids speaking softly, but carrying a big stick. Beat Army. Hope you make it to a bowl in 2010 Army. But remember, you have to win 6 games BEFORE the 2nd Saturday in December. Great Job, Mike. I am really looking forward to this one and hope it is not close. With that said, I do agree Army will be much better as a team this year and especially in years to come. I am guessing our team shouldn’t need any bulletin board material for this game although, if required, they might need a bigger bulletin board with all the puffery coming out of the woops. I find it funny talking to Non-Academy Navy because they just don’t get it. I was at the Medowlands blowout while at DH school and that Monday our instructor commented on how boring the game was and didn’t we want a close exciting game that we managed to win in the end? I asked her if she wanted a close exciting heart attack that she managed to survive at the end to a blank stare as a reply. Nuff said, they just don’t get it. Some of us remember when Army-Navy was still on the Saturday after Thanksgiving. We had Thanksgiving Day off and classes Friday. I remember being able to wear a civilian tie with WUBAs that day. As one of your plebes (’79) I remember those Saturday after Thanksgiving games. Funny ties on Friday and telling the English Professor in the 7:55 am class that his choices were CB (continental breakfast) or Santee (Basin). Wonder if they still have bearclaws or if breakfast consists of non-fat yogurt and tofu? Mike, can you tell me what’s going on when the slotbacks are at slightly different depths off the line? Seems to me that the deeper one(farther off the line) is the one going in motion. For VMI? Yeah, it almost looks like the wing-T as deep as he’s lined up. I just write it off as one quirk of the way they do things. It might be about getting better blocking angles or something along those lines. I’m not sure what it is. Good pre-game write-up Mike, … and once again another stellar effort in getting the word out … in the truest/purest football sense. Navy doesn’t have to have their “A-game” to beat Army imho, … but it sure would be satisfying to see them click on all cylinders from opening kick-off on. great write up, even if i can’t see the vids yet. Can’t wait for tomorrow! Beat Army! One thing I’ve been impressed with all year is our Linebackers. I see them having a GREAT day tmw. They will be a crew watching this at the Pennant in Sandog if anyone wants to come by…. Thanks, Mike – elegant, concise, and reflective. Your posts have taken me back to ’67 too many times to relate. Thank you. Beat Army. This is a GREAT blog. Love it. I’ve spent all day reading Mike’s posts and analysis. In the last 50 years I’ve only rooted against Navy once. The 1961 Orange Bowl against Missouri. Really looking forward to the Texas Bowl in Houston!! As Always – BEAT ARMY!!! Anderson didn’t play against VMI, so his absence against Navy should not lead to Army’s defense being “more limited”. More limited than they are with him healthy and playing. Every year, someone from Army has virtually the same quote. I think you pointed this out last year Mike. But alas, they are gaining on us boys-we might as well close up shop and conceede the game! Go Navy-destroy “gaining on us” Army! Matt – I think it was Candeto who said it. Mike had it in his AF post. He scored a TD early and said that to the bench, and Craig ran for like 10 more TD’s and the rest is history.